You’ve heard of it, you’ve seen the dramatic before and after shots on Instagram, and you may have even looked into getting it done yourself. For some, the Brazilian Blowout has become notorious in the hair realm for its transformative (and dare we say, life-changing) qualities, especially if you spend a good hour fighting with the round brush after lathering up. There are a few similar treatments out there that adopt the moniker, so before committing to one, you’ll want to make sure the original Brazilian Blowout is what your salon carries—brazilianblowout.com has a comprehensive list of participating outposts nationwide. Not unless you want it to. Your stylist will seal in the treatment with a pass of a 450-degree flat iron, and the more your stylist flat irons, the straighter your hair will be. “If you like to wear your hair curly, but just want to tame your frizz, this will help make your hair more manageable. Just be sure to tell your stylist exactly what you want, and they can tailor the treatment to either preserve the texture of your hair, or make it smoother,” Matos explains. The overall goal is to make your strands less of a burden to work with, but keep in mind that if you have naturally curly hair, it won’t air dry to a pin-straight texture. “You’ll still have voluminous body with waves if you air dry it, but if it normally takes you 30 minutes with a blow dryer, this can help you cut down the time to just 15 minutes,” she adds. Matos confirms that the treatment is safe on any hair type, and actually helps to improve shine as well as moisture levels. “Everyone is concerned because of the formaldehyde in the formula, but there isn’t any more in this than would be in your nail polish,” she says. “There is a very, very small amount, but with any chemical processing, there is always a chain reaction of bonding the treatment to your hair.” The only situation in which breakage does occur is when a stylist goes too hard with the flat iron, so be sure to tell your pro if your hair can’t take a lot of heat. “Overall, the process takes an hour to an hour and a half,” Matos says. “The longest I’ve ever spent doing a Brazilian Blowout was around two hours, so it all depends on how much hair you have and how thick it is.” Your stylist will begin by shampooing your hair three or four times to remove all the product and create a base for the treatment to adhere. Working section by section, the Brazilian Blowout formula will be applied from root to tip, then blow-dried smooth. A flat iron heated to 450 degrees will seal it in, then it’s back to the shampoo bowl to rinse out the treatment, followed by a deep conditioning mask. Finally, your hair will once again be blow-dried smooth. Provided that you remove the shampoos that contain sulfates and chlorine from your shower, your treatment should last anywhere from three to four months—possibly longer if you don’t need to wash your hair as regularly as some. Once it wears off, your hair will return to its natural curl pattern. “You’ll start to see it around the hairline first,” Matos says. “That’s your indicator of when it’s time to get it redone.” Even if you don’t get it touched up right away, there’s no obvious line of demarcation between the previously treated hair and new growth, unlike with other relaxing or straightening methods. 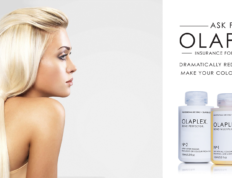 What is the Olaplex hair treatment and how does it work? 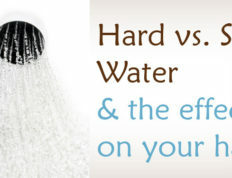 The Brassy side effects of hard water and how to fix it.